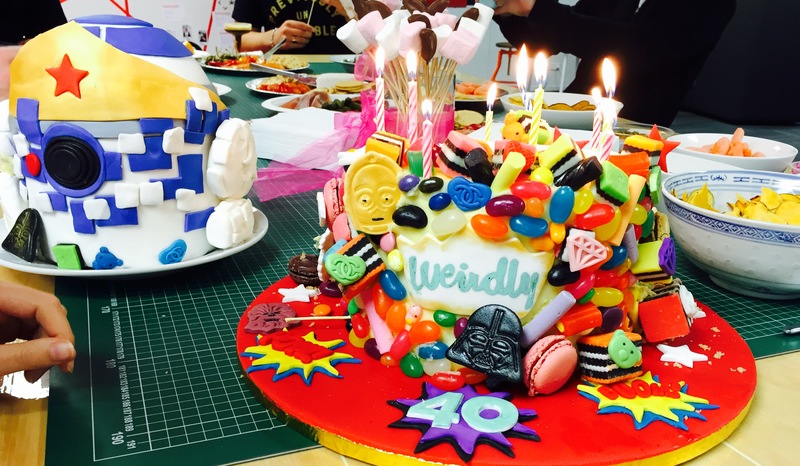 Your eyes are not deceiving you – that IS a cake in the shape of R2D2 wearing a wonderwoman crown. We worked hard at keeping the #growthsprint energy high this week – with new people starting, lots of exciting media stuff happening, launches out the wazoo and Dale’s birthday to wrap it all up. In short, we didn’t quite make our sales goal this week and that was pretty gutting. But we’re feeling good about a couple of biggies that should allow us to catch up. We’re also stoked about the new analytics features we’re rolling out (one last week and one in the week coming) that will make Weirdly even more valuable for our users. And best of all, according to our final tally, July was our best month EVER. Naturally, we had a confetti explosion to celebrate. Highlights were launching an awesome new graduate recruitment campaign for Fletcher Building this week. This entire campaign (their annual uni grad recruitment drive) is designed to be blind. That means the details that make it easy to tell an applicant’s gender, age, racial profile and other personal information are hidden. It’s a really awesome move by one of NZ’s biggest employers to try and tackle the issue of unconscious bias. It’s a challenge we feel really strongly about and, while it’s immensely complicated issue, we reckon this is a really exciting step in the right direction. Another highlight this week was getting our new Customer Success Manager – Sarah O’Leary up to speed on all things Weirdly. She’s come to us after heading up the CS-APAC team at Vend. One of the hardest things about growing fast is working out when to bring new people into the team, and then finding the time to actually induct them into your squad. It’s a battle, but one that’s worth fighting. Especially now that we have a whole person who can do all that ringing new sign-ups we struggled to do last week! Otherwise, it’s been the usual barrage of balancing big clients with the smaller ones and drumming up lots of excitement about Weirdly in the market. We released the first stage of our analytics offering last week. This has been a long time in the works so we’re really excited to be sharing it with our users. This is a paid-subscription feature that’s well worth upgrading for. You can read a bit more about it here. So off we go! Diving into a huge week three, ready to smash the targets this time. In the meantime, if you’d like to learn a bit more about how Weirdly could help streamline your recruitment. Click here for a free trial.